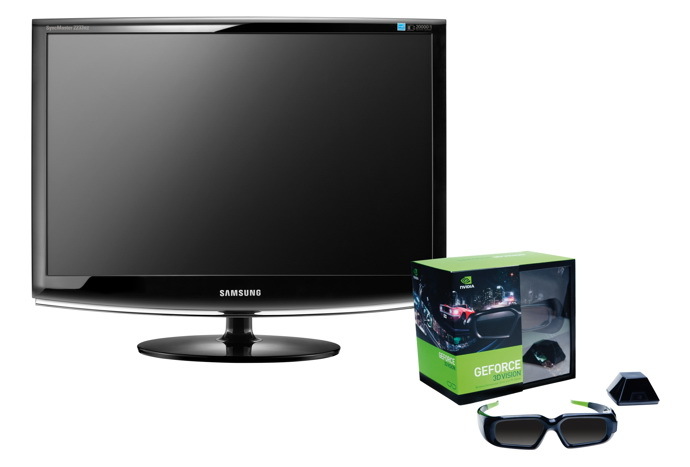 Samsung 2233RZ is the 120 Hertz (120 fps) monitor that is being sold as a bundle with the GeForce 3D Vision glasses in the European market and as a standalone LCD display of course. 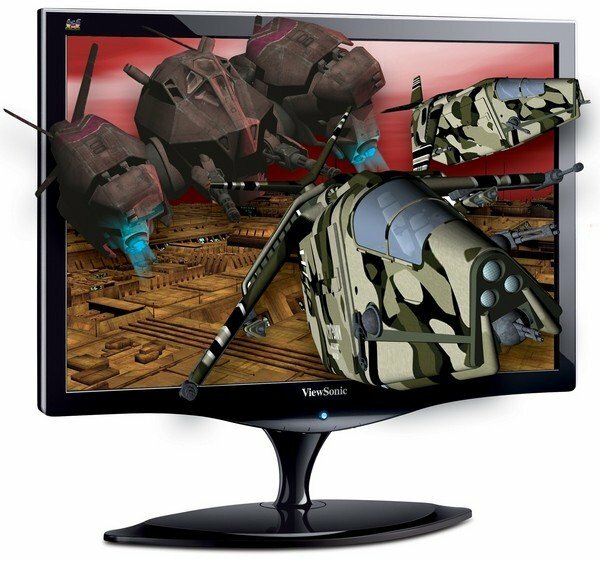 Even if not using it in 3D stereo mode you can still set the monitor at 120 Hz refresh rate and have a better and more responsive LCD display than all other models currently available on the market (ViewSonic VX2265wm is the other similar product). But lets get to the technical specifications of the display in order to see what it actually offers in both 2D mode and in 3D when used in conjunction with 3D Vision glasses. 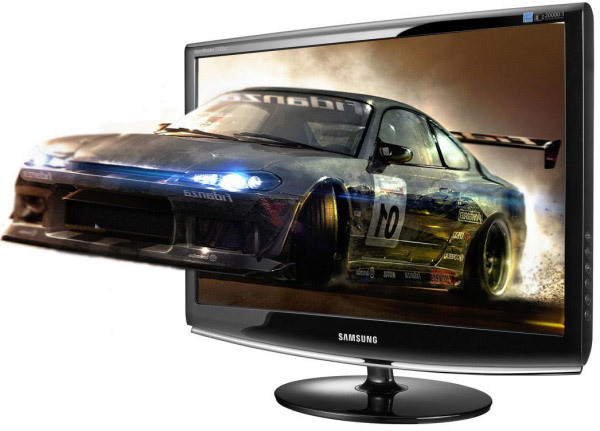 Samsung 2233RZ is a 22-inch monitor with widescreen aspect ratio of 16:10 (not the recently popular 16:9) and resolution of 1680×1050 (again not Full HD as the new 16:9 22″ displays already available). The display is using a TN panel with maximum brightness level of 300 cd/m2 (the high brightness is very important when in 3D mode), contrast ratio of 1000:1 and 20000:1 dynamic (unusable in 3D mode) and response time of up to 3-5 milliseconds (3ms for gray-to-gray and 5ms for black-to-white transitions). The viewing angles are quite good at up to 170º horizontal and 150º vertical at contrast ratio of more than 10:1 which you’ll notice when you see the display, and I should note that there is no glossy and mirror-like filter in front of the display, but a matte one which is probably better when used with 3D Vision. The display has only Dual-link DVI-D display port for connection to a PC and you need Dual-link cable in order to provide 120 Hz refresh rate over the DVI interface at 1680×1050 resolution, otherwise you’ll be limited to 60 Hz over a single-link cable. The thing that differentiates Samsung 2233RZ and the monitor apart from their external design of course is the lack of integrated speakers here as opposed to ViewSonic’s solution. One other thing that I noted in the specifications is that the Samsung 2233RZ typically uses of up to 50W per hour as opposed to up to 45W in the case of ViewSonic VX2265wm FuHzion. Also it seems that the ability to use the additional dynamic contrast is only available on Samsung’s display, but you should note that it should not be used when playing in 3D mode with the shutter glasses. When you enable the 3D Stereo mode it seems that Nvidia’s stereo driver automatically sets the brightness to the maximum level and it disables the ability of the user to lower it through the menu of the monitor.